March Revolution Against the background of a revolutionary situation existing since 1847 and increasingly worsened by the outbreak of a cyclic economic crisis, the German March revolution began in the wake of and as the immediate consequence of the Parisian February revolution. On account of the fragmentation of the country into states, the lack of a national center, the revolution had the character of isolated, yet reciprocally affecting uprisings in the individual German lands. In the so-called Third Germany, the small and greater states of the German Confederation, due to the weakness of the semi-absolutist or absolutist-aristocratic-monarchic power systems, the revolution was largely non-violent and was primarily borne by the urban population. The actions of the peasants, which in several states were instrumental in bringing down the pre-March regimes, were above all aimed at the still existing feudal charges and occurred mainly among the estates of the former immediate nobility that still enjoyed state sovereign rights and had prevented the completion of defeudalization. The most important regions of peasants' uprisings were northern Baden and northern Wurtemberg as well as parts of Bavaria and Hesse-Darmstadt. The prelude to the March Revolution was provided by a popular assembly organized in Mannheim on February 27, 1848, by Democrats from Baden. It was here that the so-called March demands of fundamental claims of people vis-à-vis the governments were formulated: arming of the people, freedom of the press, trial by jury and creation of a German parliament. These demands were raised everywhere in the March days, usually supplemented by local or regional wishes for reform, and ultimately enacted. Petitions, the agitation of the press, street demonstrations, meetings and turmoil together with the emergence of oppositional deputies in parliaments were mostly the instruments used to pressure the princes and their cabinets and to force them to give in. The princely power holders, deeply frightened over the continued existence of their thrones by t he proclamation of a republic in France , usually complied quickly with the demands of the people after a few days of subtle manoeuvering. In those regions where army dealt counter-revolutionary blows, as in Bavaria, Hesse, and Saxony, within a short time, they had to give in due to the unreliability of troops, radical popular actions, or even the threat of their use. The leading forces of the revolutionary March movement were mostly representatives of the liberal bourgeoisie; they attempted to carry out reforms and to participate in state power within the limits of their interests; they wanted a strictly peaceful course of change and fearing workers, social unrest and republican tendencies, they were anxious to compromise with the former powers in order to prevent a radical break-up of the political order. As a rule, the desired results were not achieved until the working people had been mobilized and, by their actions, had unmistakably demanded the inevitability of liberal reforms. From Baden, where already on March 1 the compliance with the March demands was initiated by a mass rally in front of the parliament and by the activities of democratic parliamentarians, the movement spread to all southern Germany and the larger part of the central-German states. Everywhere, up to the middle of March, new governments were established, dominated by moderately liberal representatives of the bourgeoisie and proclaiming programs of liberal reform. In Bavaria the events resulted in the abdication of the monarch, King Ludwig I. Due to the political-moral support given by Prussia to several princes, the revolution was not victorious in several countries of central and northern Germany until the second half of March. The uprising in Austria and Prussia was the highlight of the March revolution; in their metropolis armed riots of the people forced the intransigent pre-March regimes to surrender. In Vienna, with its population pressing for political change and after hearing the opposition's signal in the Hungarian parliament to fight against Metternich's rule, a student-organized demonstration on March 13, 1848, escalated into a storm on the Ständehaus (house of the estates). The people put up armed resistance to the troops. After the uprising of the workers in the suburbs and the ultimatum by the liberal bourgeoisie pressurizing the Hofburg, the state leadership of the Habsburg regime decided to give in. In the evening of March 13 the hitherto omnipotent Prince Metternich was overthrown, and the students were given permission to arm themselves. On the following days repeated actions by the people led to additional concessions: establishment of a National Guard, freedom of the press, vague promises to begin constitutional development in Austria and to install a new government consisting of less tainted representatives of the feudal bureaucracy. The uprising in Berlin on March 18 was pre ceded by powerful oppositional governments in almost all Prussian provinces, especially in the Rhineland. Since March 6 the insubordinate spirit had spread to the capital. Due to the brutal deployment of soldiers, the instrument in the hands of the reactionary agitators around Prince Wilhelm against demonstrators, the inhabitants' wrath and indignation grew to demand more and more emphatically the withdrawal of all troops from Berlin. When on March 18 King Frederick William IV, under the pressure of a reform wing at the court signalled a compromising approach on several questions, yet was still unwilling to comply with the demand on a pullout of troops. He even deployed soldiers against a demonstration in front of the castle, sparking an hour-long street battle that was fought with great embitterment on both sides. Some 4,000 insurgents, mostly young workers, craftsmen, and students, were opposed by 14,000 soldiers with 34 cannons. 230 revolutionaries lost their lives in the fighting. A lthough the troops were able to conquer almost all barricades erected in the town center, their power was not sufficient to defeat the uprising militarily. Therefore, in the morning of March 19, the king ordered the military to pull out from the town and to acquiesce in the formation of a civic guard. Humiliatingly, he was forced to bow his head to the dead lying in state in the courtyard. After a transitional government installed on March 19, Prussia received a new ministry ten days later, whose leading personalities were Ludolf Camphausen and David Hansemann, representatives of the Rhinish upper classes. At the same time the way was paved to the transition of the country into a constitutions state. 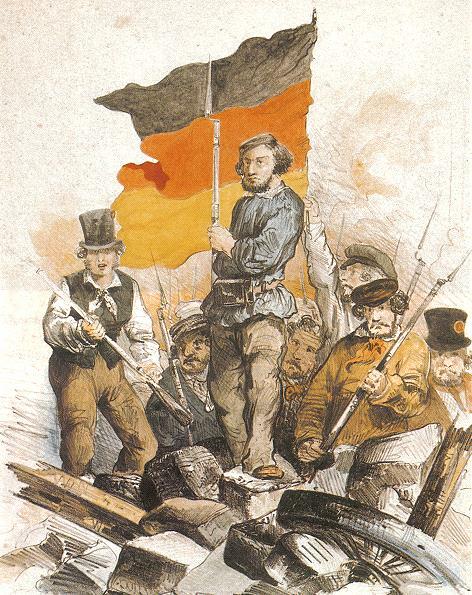 The March Revolution was the first stage in the German Revolution of 1848-49. It shook the semi-feudal bureaucratic system of rule, led to a division of power between the princes and the bourgeoisie, but left the power of government largely in the hands of reactionary forces, sin ce the old structures in bureaucracy and army remained almost untouched. Wolfram Siemann Die deutsche Revolution von 1848/49 Frankfurt/Main 1985. Günter Wollstein Deutsche Geschichte 1848/49. Gescheiterte Revolution in Mitteleuropa Stuttgart 1986. Hans-Ulrich Wehler Deutsche Gesellschaftsgeschichte vol. II (1815-1845/49) Munich 1987. III. The Other German States.